In this tutorial we will learn how to estimate the pose of a human head in a photo using OpenCV and Dlib. In many applications, we need to know how the head is tilted with respect to a camera. In a virtual reality application, for example, one can use the pose of the head to render the right view of the scene. In a driver assistance system, a camera looking at a driver’s face in a vehicle can use head pose estimation to see if the driver is paying attention to the road. And of course one can use head pose based gestures to control a hands-free application / game. For example, yawing your head left to right can signify a NO. But if you are from southern India, it can signify a YES! To understand the full repertoire of head pose based gestures used by my fellow Indians, please partake in the hilarious video below. My point is that estimating the head pose is useful. Sometimes. If you want to quickly jump into code go to the the code section. To access code in all the tutorials in this blog, please subscribe to our newsletter. Before proceeding with the tutorial, I want to point out that this post belongs to a series I have written on face processing. Some of the articles below are useful in understanding this post and others complement it. What is pose estimation ? In computer vision the pose of an object refers to its relative orientation and position with respect to a camera. You can change the pose by either moving the object with respect to the camera, or the camera with respect to the object. The pose estimation problem described in this tutorial is often referred to as Perspective-n-Point problem or PNP in computer vision jargon. As we shall see in the following sections in more detail, in this problem the goal is to find the pose of an object when we have a calibrated camera, and we know the locations of n 3D points on the object and the corresponding 2D projections in the image. How to mathematically represent camera motion ? A 3D rigid object has only two kinds of motions with respect to a camera. Translation : Moving the camera from its current 3D location to a new 3D location is called translation. As you can see translation has 3 degrees of freedom — you can move in the X, Y or Z direction. Translation is represented by a vector which is equal to . Rotation : You can also rotate the camera about the , and axes. A rotation, therefore, also has three degrees of freedom. There are many ways of representing rotation. You can represent it using Euler angles ( roll, pitch and yaw ), a rotation matrix, or a direction of rotation (i.e. axis ) and angle. So, estimating the pose of a 3D object means finding 6 numbers — three for translation and three for rotation. What do you need for pose estimation ? 2D coordinates of a few points : You need the 2D (x,y) locations of a few points in the image. In the case of a face, you could choose the corners of the eyes, the tip of the nose, corners of the mouth etc. Dlib’s facial landmark detector provides us with many points to choose from. In this tutorial, we will use the tip of the nose, the chin, the left corner of the left eye, the right corner of the right eye, the left corner of the mouth, and the right corner of the mouth. 3D locations of the same points : You also need the 3D location of the 2D feature points. You might be thinking that you need a 3D model of the person in the photo to get the 3D locations. Ideally yes, but in practice, you don’t. A generic 3D model will suffice. Where do you get a 3D model of a head from ? Well, you really don’t need a full 3D model. You just need the 3D locations of a few points in some arbitrary reference frame. In this tutorial, we are going to use the following 3D points. Note that the above points are in some arbitrary reference frame / coordinate system. This is called the World Coordinates ( a.k.a Model Coordinates in OpenCV docs ) . Intrinsic parameters of the camera. As mentioned before, in this problem the camera is assumed to be calibrated. In other words, you need to know the focal length of the camera, the optical center in the image and the radial distortion parameters. So you need to calibrate your camera. Of course, for the lazy dudes and dudettes among us, this is too much work. Can I supply a hack ? Of course, I can! We are already in approximation land by not using an accurate 3D model. We can approximate the optical center by the center of the image, approximate the focal length by the width of the image in pixels and assume that radial distortion does not exist. Boom! you did not even have to get up from your couch! How do pose estimation algorithms work ? There are several algorithms for pose estimation. The first known algorithm dates back to 1841. It is beyond the scope of this post to explain the details of these algorithms but here is a general idea. There are three coordinate systems in play here. The 3D coordinates of the various facial features shown above are in world coordinates. If we knew the rotation and translation ( i.e. pose ), we could transform the 3D points in world coordinates to 3D points in camera coordinates. The 3D points in camera coordinates can be projected onto the image plane ( i.e. image coordinate system ) using the intrinsic parameters of the camera ( focal length, optical center etc. ). Let’s dive into the image formation equation to understand how these above coordinate systems work. In the figure above, is the center of the camera and plane shown in the figure is the image plane. We are interested in finding out what equations govern the projection of the 3D point onto the image plane. Let’s assume we know the location of a 3D point in World Coordinates. If we know the rotation ( a 3×3 matrix ) and translation ( a 3×1 vector ), of the world coordinates with respect to the camera coordinates, we can calculate the location of the point in the camera coordinate system using the following equation. If you have ever taken a Linear Algebra class, you will recognize that if we knew sufficient number of point correspondences ( i.e. and ), the above is a linear system of equations where the and are unknowns and you can trivially solve for the unknowns. As you will see in the next section, we know only up to an unknown scale, and so we do not have a simple linear system. where, and are the focal lengths in the x and y directions, and is the optical center. Things get slightly more complicated when radial distortion is involved and for the purpose of simplicity I am leaving it out. What about that in the equation ? It is an unknown scale factor. It exists in the equation due to the fact that in any image we do not know the depth. If you join any point in 3D to the center of the camera, the point , where the ray intersects the image plane is the image of . Note that all the points along the ray joining the center of the camera and point produce the same image. In other words, using the above equation, you can only obtain up to a scale . Fortunately, the equation of the above form can be solved using some algebraic wizardry using a method called Direct Linear Transform (DLT). You can use DLT any time you find a problem where the equation is almost linear but is off by an unknown scale. The DLT solution mentioned above is not very accurate because of the following reasons . First, rotation has three degrees of freedom but the matrix representation used in the DLT solution has 9 numbers. There is nothing in the DLT solution that forces the estimated 3×3 matrix to be a rotation matrix. More importantly, the DLT solution does not minimize the correct objective function. Ideally, we want to minimize the reprojection error that is described below. As shown in the equations 2 and 3, if we knew the right pose ( and ), we could predict the 2D locations of the 3D facial points on the image by projecting the 3D points onto the 2D image. In other words, if we knew and we could find the point in the image for every 3D point . We also know the 2D facial feature points ( using Dlib or manual clicks ). We can look at the distance between projected 3D points and 2D facial features. When the estimated pose is perfect, the 3D points projected onto the image plane will line up almost perfectly with the 2D facial features. When the pose estimate is incorrect, we can calculate a re-projection error measure — the sum of squared distances between the projected 3D points and 2D facial feature points. As mentioned earlier, an approximate estimate of the pose ( and ) can be found using the DLT solution. A naive way to improve the DLT solution would be to randomly change the pose ( and ) slightly and check if the reprojection error decreases. If it does, we can accept the new estimate of the pose. We can keep perturbing and again and again to find better estimates. While this procedure will work, it will be very slow. Turns out there are principled ways to iteratively change the values of and so that the reprojection error decreases. One such method is called Levenberg-Marquardt optimization. Check out more details on Wikipedia. In OpenCV the function solvePnP and solvePnPRansac can be used to estimate pose. solvePnP implements several algorithms for pose estimation which can be selected using the parameter flag. By default it uses the flag SOLVEPNP_ITERATIVE which is essentially the DLT solution followed by Levenberg-Marquardt optimization. SOLVEPNP_P3P uses only 3 points for calculating the pose and it should be used only when using solvePnPRansac. In OpenCV 3, two new methods have been introduced — SOLVEPNP_DLS and SOLVEPNP_UPNP. The interesting thing about SOLVEPNP_UPNP is that it tries to estimate camera internal parameters also. objectPoints – Array of object points in the world coordinate space. I usually pass vector of N 3D points. You can also pass Mat of size Nx3 ( or 3xN ) single channel matrix, or Nx1 ( or 1xN ) 3 channel matrix. I would highly recommend using a vector instead. imagePoints – Array of corresponding image points. You should pass a vector of N 2D points. But you may also pass 2xN ( or Nx2 ) 1-channel or 1xN ( or Nx1 ) 2-channel Mat, where N is the number of points. cameraMatrix – Input camera matrix . Note that , can be approximated by the image width in pixels under certain circumstances, and the and can be the coordinates of the image center. distCoeffs – Input vector of distortion coefficients ( , , , [, [, , , ],[ , , , ]]) of 4, 5, 8 or 12 elements. If the vector is NULL/empty, the zero distortion coefficients are assumed. Unless you are working with a Go-Pro like camera where the distortion is huge, we can simply set this to NULL. If you are working with a lens with high distortion, I recommend doing a full camera calibration. rvec – Output rotation vector. tvec – Output translation vector. useExtrinsicGuess – Parameter used for SOLVEPNP_ITERATIVE. If true (1), the function uses the provided rvec and tvec values as initial approximations of the rotation and translation vectors, respectively, and further optimizes them. SOLVEPNP_ITERATIVE Iterative method is based on Levenberg-Marquardt optimization. In this case, the function finds such a pose that minimizes reprojection error, that is the sum of squared distances between the observed projections imagePoints and the projected (using projectPoints() ) objectPoints . SOLVEPNP_P3P Method is based on the paper of X.S. Gao, X.-R. Hou, J. Tang, H.-F. Chang “Complete Solution Classification for the Perspective-Three-Point Problem”. In this case, the function requires exactly four object and image points. SOLVEPNP_EPNP Method has been introduced by F.Moreno-Noguer, V.Lepetit and P.Fua in the paper “EPnP: Efficient Perspective-n-Point Camera Pose Estimation”. SOLVEPNP_DLS Method is based on the paper of Joel A. Hesch and Stergios I. Roumeliotis. “A Direct Least-Squares (DLS) Method for PnP”. SOLVEPNP_UPNP Method is based on the paper of A.Penate-Sanchez, J.Andrade-Cetto, F.Moreno-Noguer. “Exhaustive Linearization for Robust Camera Pose and Focal Length Estimation”. In this case the function also estimates the parameters f_x and f_y assuming that both have the same value. Then the cameraMatrix is updated with the estimated focal length. solvePnPRansac is very similar to solvePnP except that it uses Random Sample Consensus ( RANSAC ) for robustly estimating the pose. Using RANSAC is useful when you suspect that a few data points are extremely noisy. For example, consider the problem of fitting a line to 2D points. This problem can be solved using linear least squares where the distance of all points from the fitted line is minimized. Now consider one bad data point that is wildly off. This one data point can dominate the least squares solution and our estimate of the line would be very wrong. In RANSAC, the parameters are estimated by randomly selecting the minimum number of points required. In a line fitting problem, we randomly select two points from all data and find the line passing through them. Other data points that are close enough to the line are called inliers. Several estimates of the line are obtained by randomly selecting two points, and the line with the maximum number of inliers is chosen as the correct estimate. The usage of solvePnPRansac is shown below and parameters specific to solvePnPRansac are explained. iterationsCount – The number of times the minimum number of points are picked and the parameters estimated. reprojectionError – As mentioned earlier in RANSAC the points for which the predictions are close enough are called “inliers”. This parameter value is the maximum allowed distance between the observed and computed point projections to consider it an inlier. minInliersCount – Number of inliers. If the algorithm at some stage finds more inliers than minInliersCount , it finishes. inliers – Output vector that contains indices of inliers in objectPoints and imagePoints . OpenCV used to a pose estimation algorithm called POSIT. It is still present in the C API ( cvPosit ), but is not part of the C++ API. POSIT assumes a scaled orthographic camera model and therefore you do not need to supply a focal length estimate. This function is now obsolete and I would recommend using one of the algorithms implemented in solvePnp. In this section, I have shared example code in C++ and Python for head pose estimation in a single image. You can download the image headPose.jpg here. double focal_length = im.cols; // Approximate focal length. // Project a 3D point (0, 0, 1000.0) onto the image plane. [0, 0, 1]], dtype = "double"
# Project a 3D point (0, 0, 1000.0) onto the image plane. Great article here! Found a small mistake though. Solvepnp’s P3P method takes not 3, but 4 points, including the origin of the model. And can you explain further regarding why you recommend using P3P only with ransac? Thanks. P3P uses the minimum number of points and not all points and therefore the estimates can be noisy. RANSAC provides the robustness against noise by sampling the minimum number of points multiple times and selecting the model that has the maximum number of inliers. Thanks for replying. I had tried to use P3P with RANSAC sometime back, but wasn’t able to get good results. Iterative was good compared to using P3P with RANSAC. Maybe the parameters I used were wrong. I experimented with default parameters as well as some custom params. Didnt seem to give a good output. If you were able to make RANSAC work well, can you post them too? In most cases where the noise is small and the number of 3D to 2D matches are small, the iterative method will work better. People use RANSAC when there is a large amount of noise but they have a large number of matches. Imagine you have a 3D model of an arbitrary scene with a texture map and you are using SIFT to match features. You can get hundreds of 3D to 2D matches in such applications buy a lot ( say 30-40%) of the matches will be incorrect. In such cases the iterative method will fail miserably and RANSAC will do a very reasonable job. Can i use this to create a 3d mesh on the face, and could i also use this for eye blink detection? No. This just gives the direction in which the face is looking. Hey Satya, thanks for your reply. Any existing code that does such a thing, maybe in dlib? dlib will allow you to track 68 points on the face which you can triangulate to create a rough 2D mesh. There are a few techniques for calculating 3D mesh (e.g. 3D morphable model), but I don’t know one that is implemented in a library like opencv or dlib. In OpenCV 3.1.0 for raspberry pi 3. I removed this flags=cv2.CV_ITERATIVE. It will worked If I removed flags=cv2.CV_ITERATIVE. That is odd. Unfortunately, I don’t have a way to quickly test. But if someone else also points this out, I will change the code. This is for only Raspberry Pi 3. Not pc. Usually, I used Raspberry pi 3 all times. In Python 2/3, why did u used semi-colons? Sorry that was a typo. Semi-colons are not needed. Fixed. Thanks Dr. Satya Mallick !! I get interest to read your all the posts. The posts are very informative and clears each and every detail in minimum words. Still I have not implemented the work you shared. 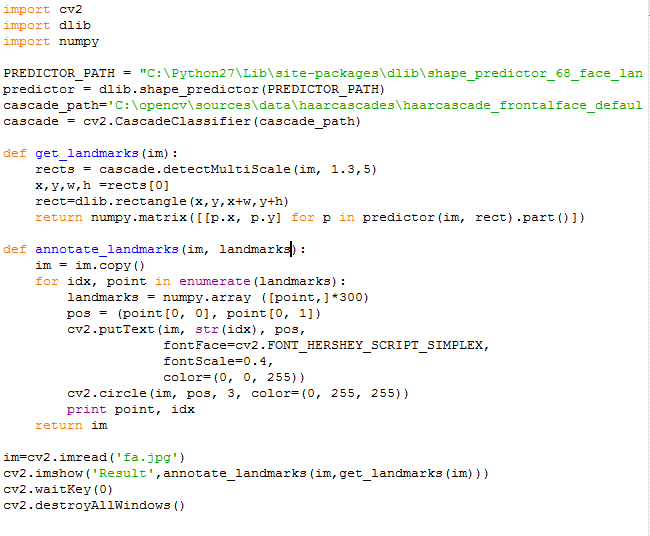 But, once I will implement it, definitely my interest in OpenCV will increase more.. I want to learn OpenCV by implementing your work. I prefer the Ubuntu platform. Let me know where i get good materials for preliminary stage. Here are a few suggestions to speed up dlib. Hope this helps. Try commenting out the following line in the example code and run in release configuration. i want to use openCV and Dlib in one python script. i want to detect faces thorough dlib and recognize them using fisher faces algorithm. is it possible? detection and recognition both are real time. Yes detection will easily be real time using either Dlib or OpenCV versions. I am not 100% sure if recognition will work in real time, but you can do recognition every nth frame. i want to save the detected face in dlib by cropping the rectangle do you have any idea how can i crop it. i am using dlib first time and having so many problems. i also want to run the fisherface algorithm on the detected faces but it is giving me type error. i seriously need help in this issue. Please see the reply above. Thanks for sharing this. I have a few doubts. Firstly what is that rotation vector i get as output from solvePNP, also how can i get a full 3×4 projection matrix which can take my 3d points to 2d from this? 3×4 projection matrix is simply rotation and translation concatenated as the fourth column. Thanks for sharing this project. However, for me it is quite noisy. I calculated the pitch, which sometimes jumps by 30 degrees, especially when my face is frontal. Did you try adding points close to the ear? Or are they generally unreliable? Any idea, how to make this more robust and accurate? the detected faces but it is giving me type error. There is a mistake in left eye 3d coords in the text (“Left corner of the left eye : ( 0.0, 0.0, 0.0)”). In the code they are (-225.0, 170.0, -135.0) which seem to be correct. Thank you so much. I have fixed the mistake. hi, Satya, I try to use some other points to calculate pose, could you please tell me where you get these 3d coords? hi, Max, I try to use some other points to calculate pose, could you please tell me where I can get other landmarks 3d coords? I was wondering how i can get the 3D model points in real time (like i can see in your video with the vector that comes from your nose). If you look at the code, I have put a 3D point some distance from the nose in the 3D model. I simply project this point onto this image plane using the estimated rotation and translation. Hi, this is really a fantastic blog. But I’m wondering what is the measure of the image coordinate and the world coordinate? Are they pixel and millimeter? If you look at my version of dlib, you will see the indices of 6 points. I have shared the C++ code below. I run the program in xcode,but it’s too slow than compiled webcam_head_pose. Dear Satya, thanks for sharing this post and explaining it. I am interested in developing gaze estimation program. It can estimate the center of pupil. In other words, I have the point of the center of pupil. How can I estimate gaze on computer like head pose estimation ? Thanks a lot. You will have to detect the center of the pupils first. Dlibs landmark detector does not detect it, but it is possible to do so by retraining a landmark detector with your own data that contains the center of the eyes. In fact, in a few weeks I plan to release a model with the pupil center. I really thank this article. I’m so sorry but is there an example of webcam_head_pose in python? Sorry, I don’t have a python version currently. But if you follow the logic in the C++ code, you will be able to write your own. There are not many lines of code. Thanks Satya for this amazing tutorial. I would like to get you advice on how to reduce jitter resulted from pose matrix when used in augmented reality. Thanks for the kind words Mohammed. One option is to smooth out jitter by calculating the moving average of the points over multiple frames ( say plus and minus 2 frames ). i was thinking of converting the rotation matrix to quaternion, average it and then back to rotation matrix. will this work? Hi! This is really a fantastic blog. I’m wondering what is the measure of the image coordinate and the world coordinate respectively? Are they pixel and millimeter? The image coordinates are in pixels, but the world coordinates in are arbitrary units. You can produce the world coordinates using real measurements in millimeter or inches etc, or it could be just the coordinates in some arbitrary 3D model. Wow that was a very fast reply! Thank you for your answer. Can I interpret your answer as the units of the world coordinates actually does not matter in computation as long as we keep the consistency of the measure of each point in 3D model? Hi Satya, does the higher number of model points affect the precision of the estimated pose matrix? Yes, the pose estimate can be made better with more points. Also, if you could have some points on the ears etc. , the pose estimate will be more stable. sir can i know what are the algorithms used here to estimate the pose? Hi Satya! Is there any functions in OpenCV or any other libraries that I can use to find the rotation 3×3 matrix R and the translation matrix t when given the intrinsic camera matrix, the 2D image points and their corresponding 3D model points? Or I have to implement the wheel to find the extrinsic camera matrix in this scenario? Yes, solvePnP does precisely that :). Hi Satya, thank you for your quick reply again! But when I run this code, the rotation vector rvec returned is actually a 3×1 column vector. I don’t think that is the 3×3 rotation vector that I actually want. I see. It really really helps! Thank you so much! Hey Satya, I was trying to do just a face recognition using dlib and standard face landmark from their site, it seems like the features and matching are not rotation invariant, I was wondering if you have any ideas how to make the face recognition rotation invariant with dlib? Hi Alexey, Face Recognition usually means identifying who the person is. Landmark detection can be used as a preprocessing step in face recognition for alignment. Does that make sense ? Thanks for replying. I mean face detection phase inside dlib, seems like the landmark detection is not rotation invariant, so when rotate the camera like 90 degrees it doesn’t detects a face. Maybe you have some thoughts where to look to fix that. Thank you. If you’re using the “.dat” file that came with dlib then it’s limited to detecting the 68 facial landmarks that it was trained on. To get it to detect a profile view you’ll have to create a new “.dat” file using several photographs of people with their faces turned 90 degrees to the camera. In the /tools directory you should find imglab which helps you do this. Hi Siddhant. If the camera moves you get the relative orientation of the object w.r.t the camera. But I guess you are asking how do you recover camera motion. For that you have to look at static parts of the scene, find point correspondences. If the point correspondences come from a plane ( e.g. the floor or one wall ) you can estimate Homography and decompose it into R and t. Otherwise, you need to estimate the Essential Matrix / Fundamental Matrix. BTW if you are doing this to learn, go ahead and implement these yourself. But if you are using it in a real world project check out VisualSFM, Theia, and OpenMVG. Hi Satya and thank you for your tutorial. It is very useful for me. I would have one question to ask about swap face. I would like to do an android application about putting model’s face to a user’s face so that they can see the result for applying the cosmetic in our application. I have watched your tutorial (face swap and face morph ). Which one do you think is more suitable and can I swap their face feature and without change their face size and hair style? Because I saw that the face shape would be changed in the face swap tutorial. Thank you very much. Thanks. Both of those are not actually good for applying makeup. For makeup the technique is very different and each makeup element is rendered differently. You can try to look at something I did at my previous company ( http://www.taaz.com ). If I am doing a college assignment, which one do you think would be more suitable? This tutorial shows how to unproject 2D points to 3D points, which is a somewhat interesting optimization/fitting problem, but to have a working solution, the important bit is finding where the feature points are in the faces in the input images — corners of eyes, nose time, mouth, etc. I can’t find any code in your github that actually calls the opencv face detect functions — there are just files with hard-coded point locations as input. How did you generate these input files? That is done using dlib. This is the file you need. Great post. Do you have a suggestion as to how to derive 3D coordinate locations for the landmark features themselves, rather than the entire head? 1. Raycast from a given 2D landmark position to the head mesh model and calculate the point position where the ray intersects. 2. Render a position map of the head mesh from the camera POV (i.e. render the XYZ coordinates of the face model into the RG and B channels respectively), then retrieve the pixel value at the location of the landmark. 3. Render a depth matte of the head mesh and use its value paired with the XY screen coordinates of the landmark to derive the world XYZ from these. Not sure it there’s a simpler approach, or which one of these would be the most efficient, since I haven’t dealt too much with rendering 3D objects via OpenCV. If you have a 3D triangulated mesh and you have found the head pose using the method I have described, you can use the project any point on the mesh to the image plane. Conversely, if you want to estimate the 3D location of a 2D point, you can transform the mesh into camera coordinates ( see figure in the article ), and shoot a ray from the camera center through the pixel location and see where it intersects the mesh ( in camera coordinates ). Obviously, it is possible the ray will intersect the mesh multiple times and so you need to choose the point closest to the camera. YEs, I’m actually already putting a workflow together based on using your pose prediction to inform a more detailed mesh. Yes it would be better. In fact I have done something similar for a project. It is very difficult to find the same person under different lighting conditions. You also need to label all those images. So the best trick is to run the standard landmark detector on the person’s face, fix the points that are not accurate, and put these new images in the training set as well. 50% images of this person and 50% of random people will still bias the results toward this person’s face and also have sufficient variety in lighting etc. Hope that helps. Yes indeed, thank you. I actually plan to add custom markers to the face and train those (i.e. dots at landmark positions like cheek bones, corner of mouth and above eyebrows). I imagine at that point using other faces would just confuse the results. And if you don’t mind me asking one more question: in the case of adding custom markers would the shape of the marks need to be unique, or would their proximity to facial features (e.g. a marker just to the side of a mouth corner) be sufficient for the training to see them as unique? If you mean using the 2d landmark points that come from dlib and are therefore subject to skewing/scaling depending on perspective and head rotation (i.e. the points before and unrelated to pose estimation), wouldn’t this become increasingly more inaccurate with more pose rotation beyond zero, and translation away from the center of the camera image (e.g. if there is significant perspective distortion)? What would the above method give, that isn’t already achieved by taking the 68 landmark points’ 2D camera-image coordinates, scaling them with respect to the target 3D coordinate system, giving a Z-plane of X Y positions, then translating and rotating this collection of points by the pose estimation matrix? Or are we talking about estimating the 3D location of a 2D point that has had further transformation to take the perspective of the device camera into account? Hi Satya, Thank you for very good tutorial about dlib and opencv. I am beginner at c++ and I have some question to ask about webcam_head_pose.cpp as in code. My goal is to draw laser from eyes like Superman so I need to get eyes position from face. Is there anyway to get eyes position from it ? Thank you very much. You will have to train your own dlib model that contains the center of the eyes. You can also use the points around the eyes to come up with a heuristic for the the location of the center of the pupil, but it won’t be very good. Can we use the information determined from this, to get the location of a real world object from it’s pixel co-ordinates? For example, I use an A4 paper to do the mentioned steps. Can I then use the translational vector, rotation vector, and my knowledge of the dimensions of the paper to get the real world location of a coin next to it? For 3D you need two cameras. This just gives you the pose. The translation vector here does not correspond to real world. It is w.r.t the coordinate in which the 3D points are defined. My project is “Density Estimation of crowd”. Video is captured from a drone camera and i have to count number of heads. And i have to code in opencv python.can someone guide me please? Hi. nice tutorial ..But its running slow on my system i.e. 30fps only. Also it detects only within a limited range. Outside that it simply doesn’t detect at all. Is this problem in actual system also or only my problem? How to increase speed further? i have set AVX instruction flag still no effect. I want the computer to know whether the user turns his head left, right, up or down. Thus, based on the pitch and yaw, can u provide some suggestions to let the computer learns itselft? Hi Satya. Great site, I’m learning a ton. I would like to clarify my understanding of the assumptions made, and the preprocessing necessary. Firstly, the 2D image points, i.e. the 2D locations of the nose tip, chin etc., am I correct in assuming that they are the result of a facial landmark detector run beforehand? Secondly, I did not understand clearly where the 3D model points where taken from, and how I would need to alter them for my own use? Hi, Was your question answered? even i have similar question. yes, the 2D points are a result of facial landmark detection. The 3D points were simply approximated by me. If you have a 3D model of a human head, you can use the points from that model. Sir can you tell me how you calculated the 3d coordinates. Does it matter to normalize the template 3D points (defined above in step 2), and scale them to the size of the detected face? It does not matter. The transformation you calculate has scale embeded inside. Hi Satya, I’m using a checkerboard or circles to use solvePnP. In this case, how many pictures do I need to prepare? Only one picture is fine as you did if it includes several points? Also, I noticed that the latest calibrateCamera in OpenCV3 accepts the object points in the object points’ coordinate frame (= checkerboard coordinate frame), and not necessarily be in the world frame. Is it the same for solvePnP? You cannot have true 3D coordinates because it is a single camera based system. Hi Satya, The way you have presented this topic is so simple and awesome to understand. My question is, I know the 2D Coordinates on the images(Image points) where feature is located. I know that i can estimate the 3D world Coordinate with Image points and camera parameters. Can i use the calculated 3D world Coordinate and Known Image Points to find the Pose?. If yes, how accurate will this be? Yes, you basically need the 3D points, cameraMatrix and the 2D points to find the pose. Sir,can you tell me how you are extracting the 3d points from 2d. Hi Satya, how to estimation gaze position based on the information which we get from face landmarks? I tried webcam_head_pose example in https://github.com/spmallick/dlib. Unfortunately, I only see the raw images from the webcam without any head pose and face landmarks. What would be the problem? Hi Satya, Thank you very much for your tutorial. I have a question: what if the images are captured by webcam in real time? How can you get the 2d image points and 3d model points in this case? The 3D model points remain constant. The 2D points can be estimated using Dlib’s Facial Landmark Detector like we do in the tutorial. I noticed that in your post, the 3D model points are not specialized for a specific person. Could you please tell me what model you use to locate those landmarks? Many thanks. Hi Satya, in a typical front headshot with the subject basically facing the camera, I see how you can use this to estimate slight tliting sideways and turning of the head left/right. However, how well does this work for estimating forward and backward tilt when you’re using an uncalibrated camera and generic 3D model. Working with these landmarks, it would seem to me that there’s too much variation between individuals in nose length, nose vs. mouth position, etc to make a determination. Of course a partial side view would solve this, but that’s not always possible. Am I missing something? Are there better approaches than this? Or ss the ability to do this just one of those things that just make us humans special? 😉 Thanks! Hello Satya, thak you for sharing your knowledge. And another question: Are there any functions in opencv to train my custom model and making accurate landmarks predictions? We wrote a tool in MATLAB a while back for a client. Unfortunately, I cannot share it for that reason. I Have a doubt sir,values given by rotation vector and translation vector,what they will signify? As for a rotation of about 120′ in ‘yaw’ i m getting values in range of [-6,6]. It’s not in degree then what is it?? There are two coordinates in 3D — the one attached to the camera using which the picture was taken and another attached to the 3D model. The rotation matrix and translation vector relate the two coordinate systems. In other words, you can apply the R and t the 3D point in the model coordinates to find the coordinates in the camera coordinates. Thankyou for your crucial time. Actually,what i m trying to achieve is based on some threshold value of rotational matrix i want to go for face recognition.What i mean is if the value is below or above some threshold then only i will go for recognition like if side pose is there then my face recognition algorithm does not able to extract features correctly and will give wrong result as well as waste my computational time.SO, do u think it is feasible?? Please share your thoughts on same. Thanks for the tutorial, Satya. This seems to have become Google’s go-to article for face post estimation. Could you please explain the reasoning behind the discrepancy between the coordinate systems? Running your example gives me a rotation vector of roughly [0, 2, 0]. Inverting the sign of the y-coords in the 3D model gives me a rotation vector roughly [0, -1, 0]. It does not matter how you define your coordinates. The R and t will adjust to whatever system you use. The only check you should do is to apply the R and t to the 3D points, and then project it only the image ( face ). If the 3D points land near their 2D counter part, your estimation is correct. Hello.This is a great tutorial but can you explain what exactly we are getting in the rotation vector obtained? Hello Satya, I am trying to run it with python. How can I find my Reprojection Error? The ouput picture looks quite good but I am not sure how to interpret my euler angles. I am a little bit confused. I thought, I start being the camera (X right, Y down and Z to the front). Then I start due to euler convention turning on x, then on y’ then on z”. But the new coordinate system is never how I expected. Even though the blue line points allways in the right direction. Hi Satya, Thank you so much for this tutorial. I learn a lot of things from your blog. Can you help me with head pose estimation? I’m integrating head pose estimation in iOS. It’s work fine, but the euler angles X value when my face is around 90 Degree. I wonder that maybe something wrong with camera matrix in iOS or the coordinates is not correct? 1. Did you use 3D model as a reference for finding the third coordinate of 2D. Or Just assuming the third coordinate in your code. 2. If you using the 3D model as reference, then how do you find third coordinate of 2D. 3. Is there any possibilty to find the translation and rotation before obtaining the third coordinate of 2D. 4. Can you expain more detail about 2D to 3D which you have derived. What is the problem and how can I solve it? They keep changing the names of these constants and breaking backward compatibility in the Python versions. Try cv2.SOLVEPNP_ITERATIVE and let me know if that works. I will update the post accordingly. That was a very quick answer Thank you. Indeed it worked perfectly. I also tried the c++ code but this produced a lot of errors. Can you help on this?? I am trying to use your code to estimate camera position/angle in soccer field. Here is my calibration frame with four points. No matter what focal I set third angle along Z axis is calculated around 40 degrees which does not make any sense because actual camera can only change angle along X, and Y axis. Hi Satya! This site is great and very useful for OpenCV begginers like me. I saw your webcam_head_pose.cpp code and I was wondering what OpenCV and dlib version you used? Thank you. I can’t remember the exact version of OpenCV and Dlib, but I think it should work with the latest version of both ( i.e. OpenCV 3.4 + Dlib 19.10). Hi Satya. Thank you for the tutorial. I would like to ask you how i can find the camera position using the R|t . Actually i want to measure the distance between the object and the camera. Whenever I switch from solvePnP to solvePnPRansac, my results become much worse. I also created sliders on screen to modify iterations, min-inliers, and reprojection-error, to see if I could improve from the visual feedback, but had no luck. Do you recommend using the default params for the above style of face tracking? Or would you be customising them to suit the scale of the 3D reference points (i.e. a reprojection error more in terms of 100-200 units rather than the default 8.0)? Excellent tutorial , thank you. M having trouble finding the world coordinated for the arbitrary reference frame for facial landmarks. Can you point me towards a good resource. I compiled your code without any errors, but when the program launches, the camera window pops up but just freezes. I get an infinite loading. Any idea where this might come from? So I have a simple question. How can I extract the information if the person is looking left, right or straight from this rotation and translation matrix? Sorry, I just saw your comment. Hi Satya, I want to measure the actual size of the mouth and eyes. Distance from mouth to eyes? How to do that? Hi, thank you for the very well explained tutorial. I have one question. Let’s say that I want to find the 3D points from a given 2D image. I was thinking of going through the steps, defining a mapping between 2D and 3D points, then I could use the transformation matrix to reverse the process, am I right? Hello Satya, thank you for sharing your knowledge. Is it possible to run this application in GPU? We are using Jexton TX2. Does the code support CUDA? Hi Satya, Thank your for your tutorials. I rewrite the webcam_head_pose.cpp into python, and it works good. I’m curious that, given detected skeleton keypoints (shoulders, hips, nose), is it possible to estimate body orientation? From my opinion, the key is to get the 3D model of human body, while I can’t find it. Thank you.